One of my favourite things about being apart of Critical Dietetics is the opportunities I get to meet others pursuing paths unique to the field of dietetics. In November I had the pleasure of interviewing Julie Rochefort about her work with Shift the Focus. As mentioned in my previous post, Julie is a dietitian who has taken her critical questions and thoughts and is doing with them! Can you tell Critical Dietetics readers and followers what HAES is about? The Health at Every Size (HAES) approach is about trusting our intrinsic regulatory processes and motivation rather than our extrinsic cues and influences. For instance, listening to internal regulatory processes such as, hunger and satiety rather than following dietary restrictions (i.e. intuitive eating). It supports active embodiment – that is enjoying the 5 k run for the pure enjoyment of it instead of striving for structured exercise. And lastly, at its core, the HAES approach is about accepting and respecting your body and recognizing that health comes in different sizes and shapes. What is it about HAES that sparked your interest and passion? What sparked my interest in HAES was essentially my professional “awakening”- or as some of my friends and fellow graduates would say, breakdown. It occurred during my second semester of my graduate studies at Ryerson University while I was working on my advocacy paper; which would become my post on the National Dialogue for Healthy Weights: Shift the Focus (http://ourhealthourfuture.gc.ca/2011/04/06/shift-the-focus-away-from-weight. I was in the middle of synthesizing the research I found on weight bias and discrimination for my paper and realized that, as a nutrition professional, my professional education and training was based on a weight=health approach and at some point during my training, I may have cause harm to one of my patients. This is where my breakdown occurred. I was in disbelief and upset that the HAES approach was overlooked in my training. I sat silently and stared blankly at the data that questioned everything I had learned, and practiced. While struggling to find direction, I knew I had to find an alternative way to practice and [I] put away my measuring stick. My search brought me to the HAES community which enabled me to move forward and further my practice in an ethical way. What are your goals with HAES? My goal is to continue practicing with a HAES approach while advocating and mobilizing HAES onto the public health policy agenda. I am currently writing research proposals in order to further understand how to remedy against weight-based discrimination both within society and the dietetic profession. Can you tell CD readers about your TEDx Ryerson talk on November 20th 2011? http://www.youtube.com/watch?v=vAXtaczwU_I You can watch my TEDxRyersonU talk when it is posted by http://tedxryersonu.ca. Thank you Julie! We look forward to sharing your talk on our blog when released! 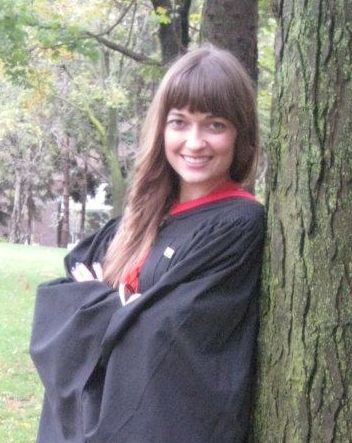 Above: Julie at her MHSc’ convocation at Ryerson University. Interviewed by Michelle Kwan, November 2011.